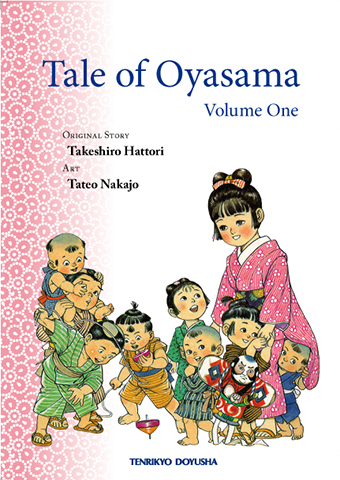 Tale of Oyasama, vol. 1, has recently been published by Tenrikyo Doyusha Publishing Company. This book presents an English translation of Part One of Gekiga Oyasama monogatari, newly revised edition (aidoku shinso ban), published in Japanese in 2008. Gekiga Oyasama monogatari is a manga rendition of The Life of Oyasama, which is a primary source for understanding Oyasama’s fifty-year Divine Model, which the followers of Tenrikyo are striving to emulate in their daily lives. It is the translators’ hope that this English translation will “help bridge a cultural gap between Oyasama’s historical background and ours by providing a pictorial narrative of Her life in the English language and, thus, assist many people unfamiliar with the Japanese language and culture to come closer to grasping the parental love infused in Oyasama’s Divine Model” (Translator’s Note). Originally, the translation project was started by a group of several members of the America and Canada Diocese and has benefited from contributions from members of the Hawaii Diocese. The initial version of what is offered in this volume was serialized in the monthly newsletter of the Mission Headquarters in America, beginning in March 2010, and was subsequently revised at a translation conference held in October 2015. Plans for the second and third volumes are in preparation.